This time my beer consumption was completely divergent from Beer of Tomorrow‘s, regardless, here are my alternative picks. I was in Seattle for a gaming convention (my con report is here), but I’m not one to attend an event in another city without fitting in some tourism, regular and culinary. With the help of a handful of twitter interlocutors, local guidance, and the internet, I found several places and beers worth talking about. A Silver City St Florian IPA at The Collins Pub. The Your Black IPA is a Porter award: Naked City Black Hops CDA which turns up the roasted malt and turns down the hop finish. Made especially notable because the server at The Collins Pub had just told my compatriot that the porter had blown and the closest thing remaining on tap was a stout. No mam, you are incorrect! But most importantly, it’s an excellent beer, no matter what you call it. The tap list at The Collins Pub. Most Eyebrow-Raising Flight: Elysian Brewing had two flights on offer at the Capitol Hill Brewpub location, one with their regular beers and the other with a special selection of limited or seasonal beers. Obviously I went with the second. I did intend to return for the first, in particular to try the Avatar Jasmine IPA, but the weather was so hot and sticky all weekend and the air-conditioning so absent, that I couldn’t bring myself to repeat the 20-30 minute uphill walk. I’ll get you next time, Jasmine IPA! The tap list at Elysian. The flight I did try, however, did not disappoint. The Ruin Rosemary Agave IPA integrated the respective ingredients sublimely; the Oblivion IPA had an apricot frozen yoghurt nose and despite the final coffee and bread notes, was the palest brown ale I’ve ever seen; the Oddland Peppercorn Saison blended white, black and pink peppercorns with a deft touch; the only disappointment was the Superfuzz Blood Orange Pale, which had a nice nose, but a boring palate. Admittedly, if you say your beer has orange, I expect ORANGE, but the palate just didn’t deliver what the nose promised. Despite the names and ingredients, none of these beers were particularly intense or aggressive, just very well done. A statement which could well be applied to my experience of the Seattle brew scene as a whole. Pork belly and cornmeal waffle at Skillet. Mixing a delicious Islay-based cocktail at Canon. Finally, Best Quality Brew Pub Disguised by Tourist Tack: The Pike Brewing Company. Hidden away in the most touristy part of Seattle and decorated to revel in a tourist trap vibe, my suspicions were instantly buttressed by the rehearsed and overly deferential pater of the bartender. I hadn’t specifically planned to visit what seemed like an obvious tourist trap, but I went in to use the bathroom and kill 30 minutes before meeting a friend for more downtown wandering. Wow. Their standard tasting flight was so good, I ended up staying for a second flight and a light meal. The first flight comprised Naughty Nellie (a golden ale, but more like a pilsner), Pike Pale (quite sweet with honey notes), Pike IPA (meh), Kilt Lifter (a balanced blend of sweetness, smoke and a hint of hops), Pike XXXXX (a stout tasting of chocolate and soy sauce), and Monk’s Uncle (a very drinkable apple and wine triple). These were all very competent and interesting enough that I really wanted to at least try the Octopus Ink IPA, and that was the second flight clincher. Passionfruit nose and palate in a Black IPA? This would be in the running for the best beer I tried all weekend. In fact, I’d have to consider it for a half-year top five list. The Doubble Troubble DIPA was also lovely and tropical. Every now and then Mt Ranier would leap out at me from behind buildings. Seattle, I raise a glass to you! 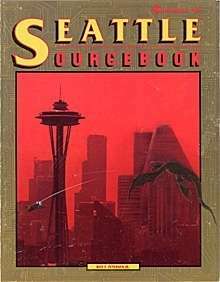 My next Seattle Pilgrimage will be inspired by more than just Shadowrun and the Seahawks! Next year, let’s go to Sun Liquor. Crazy good gin. Also, not so fond of Superfuzz either. I had it Randalled with pineapple and it was still kinda weak.